I’m working on getting back into the written review swing, focusing on items I don’t get the chance to review in detail on the AFB Podcast. 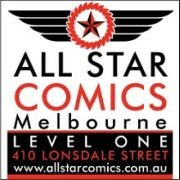 I'm going to start badging these as "Scotty's Toyroom" Reviews from here on out. 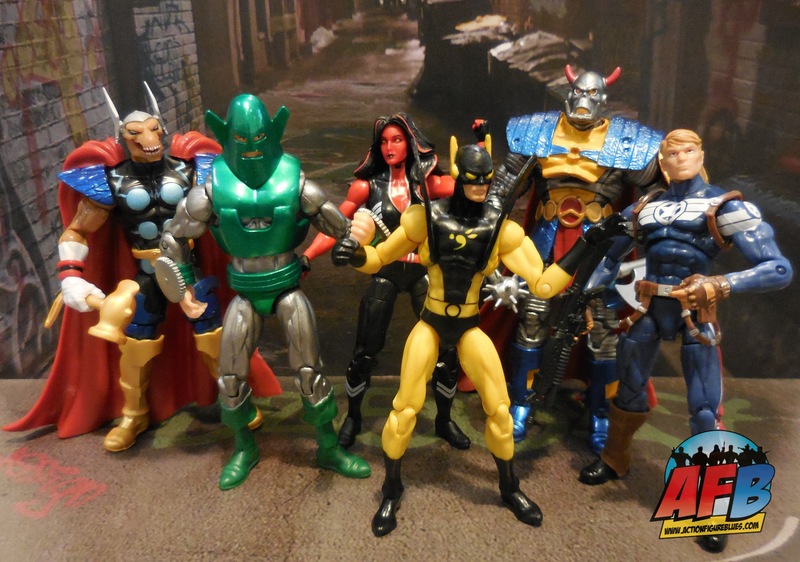 Tonight I thought I’d look at the latest wave of Hasbro’s Marvel Infinite Series that I’ve picked up, seeing as reviews of it’s predecessor, Marvel Universe, have always been popular here. In this wave, there are only three characters new to the line: Red She-Hulk, Whirwind, and Death’s Head. Who? Yeah, we'll get to that in a moment. Having a fairly extensive Marvel 3 ¾” collection at this stage, I’m really only focusing on the new characters to the scale, but I did end up picking up three repeat characters as well: Steve Rogers, Yellowjacket and Beta Ray Bill, for different reasons. I’d never previously purchased a Steve Rogers figure at this scale, and the original Yellowjacket I owned had very disappointing paint. As for Beta Ray Bill, well, it’s Beta Ray Bill, people, and he’s just awesome! I quite like the new packaging for this re-branding of Hasbro’s 3 ¾” Marvel line. I might feel differently about these if I was collecting these on card, but as I’m an opener the change is welcome, and they look quite eye-catching on the pegs. Also, the Marvel Universe packaging was designed to house the figure bases / Secret Files Cards which are no longer part of the line, the redesign makes sense from a practical perspective as well. As for the three new characters, Death’s Head has to be the pick of the bunch. This is the coolest action figure of a character I’d never heard of. And when I say cool, I mean in a funky, dorky kind of way. He might be a ‘90s Transformer type character, but he’s been lovingly recreated here with some pretty intricate sculpting that has been supported by very nice paint. Death’s Head comes with three accessories: a mace, a cleaver-style blade and a shield. The photo on the back of the packaging shows the figure with the two weapons stored on his back, but I can’t see how to make that happen. I am historically accessory-disabled, but if this is actually possible, it’s pretty hard to work out. Whirlwind is one of those retro villains who hasn’t seen much action figure love, and I’m pleased to see him included in this line. As a regular Avengers foe, he fits in nicely with many figures in this line. Customisers who might prefer his more classic shirtless look now have the pieces they need for an easy project, made easier by the fact that the armoured ridges that should be visible on Whirlwind's arms and legs haven't been sculpted or even painted on. While not all the details I'd like to see are there, the paint on my Whirlwind is flawless, and the use of metallic paints really makes this figure nice to look at. The typical bendy legs of these figures make my Whirlwind a bit bard to pose, but in the end I was able to find some balance so that he can stand in fighting and neutral poses. It does take a bit of shine off the figure, and so does the lack of definition of his mouth behind his mask, which is unnecessarily mucky. 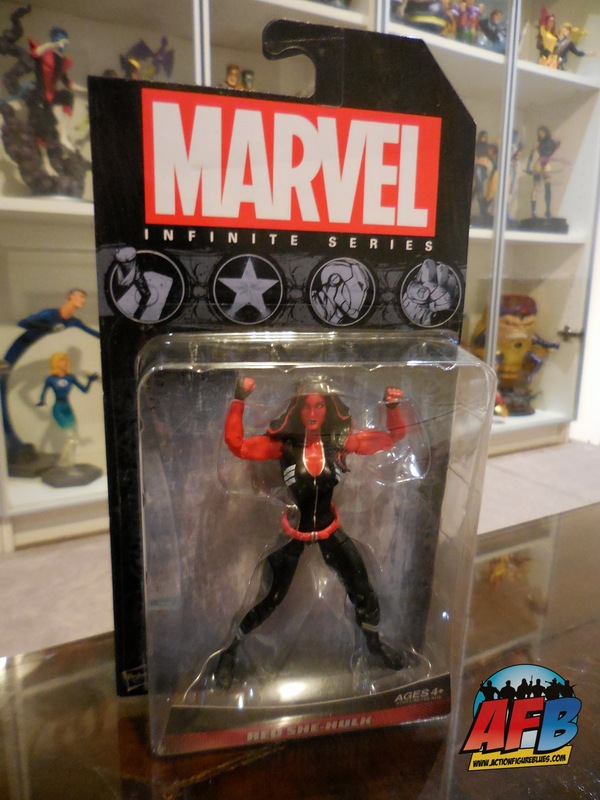 Red She-Hulk has already seen plastic in the 6” Marvel Legends line and now joins the 3 ¾” ranks in this wave. She showcases the newer large female bulk nicely and has an excellent range of articulation and pose-ability. I particularly like the use of softer plastic for her hair, which gives her a good range of neck movement. She has a basic black bodysuit, but some silver stripes which have been neatly applied. She also had a belt, which is applied as a separate, loose piece. She comes with no other accessories. The only blight on this figure is some small black markings on the red of her face around her mouth. The figure appears to be cast in red plastic, and this results in some lack of definition on the painted elements of her face. Since the female faces on these figures are usually sculpted in such bland pose, this really causes her to fade away a bit. All up, these are fun new additions to the Marvel 3 3/3” world. There’s a really nice mix of classic, new and left of centre characters here to give me hope for the future of this line – whatever it’s called! You can see a full photo album of these figures at the AFB Facebook Page, and your comments there or here are most welcome!